Use of embedded particles of colored glass material (e.g., aventurine glass). “The resultant color from any metal oxide depends on the nature of the glass itself [i.e.lead potash, soda lime, etc.] and the purity of its ingredients and also on the furnace conditions, as to the the degree of heat or the existence of a reducing atmosphere” (Newman 1977, p. 197). 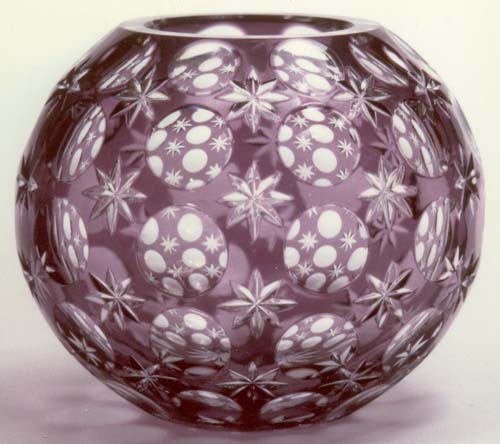 A modern rose bowl, purple (amethyst) cut-to-clear, that uses a universal shape and international motifs that have antecedants in the nineteenth century. As a result, the bowl’s date and place of manufacture cannot easily be determined. Lead glass. 12-pt star on base. D = 6″ (15.2 cm), H = 5″ (12.7 cm), wt = 2 lb (0.9 kg). Sold for $100 in 1990. 1. The CMG sells, in its gift shop, packets of colored glass lozenges (that look like after-dinner mints) made from several of the metallic oxides listed here. 2. Matthews, Thomas, 1995: Color overlayed (sic) cut glass, in AMERICAN CUT GLASS IN COLOR, Special Edition No. 1 of The Hobstar, pp. 5-7, Feb.